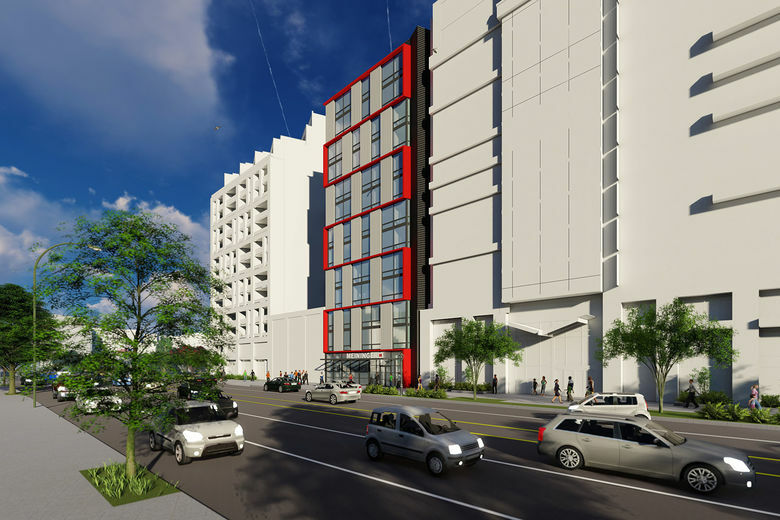 MEININGER Hotels announces plans for its first hotel in the United States in Washington, D.C. The hotel, with a gross floor area of 74,500 square feet, will be a newly built 13 story property. Staying true to MEININGER’s concept, the room categories will range from classic double rooms to private and shared multi-bed rooms. There will be ample public areas on two floors including a large reception, lounge and bar area on the ground floor and a breakfast area, guest kitchen and game zone on the second floor. The MEININGER Hotel Washington D.C. will be the perfect starting point for those on a city break thanks to its excellent location. Thirty-five New York Avenue is a highly visible site located near historic Union Station. Also, the NoMa-Gallaudet U Metro station is situated less than two blocks from the hotel connecting our guests to all that Washington D.C. has to offer, including the White House, Capitol Building, monuments, famous museums, convention center, sports venues and all the major transportation hubs. NoMa, named for its location north of Massachusetts Avenue, is a vibrant, growing neighborhood near Capitol Hill, the seat of the U.S. government, and the Mt. Vernon Triangle, Penn Quarter and H Street neighborhoods. The area features free outdoor WiFi and movies in the summer, great walkability and multiple transit options. The neighborhood is also home to numerous restaurants, bars, grocery stores, shopping and cultural attractions. The epicentre of DC’s culinary scene, Union Market, is a mere 10-minute walk from the hotel. Listed among the top five market halls in the USA by Gourmet Magazine, Union Market is a food and delicatessen venue which has everything one could possibly want from more than 40 vendors. “We are very pleased to be able to realize our first project in the USA in the capital Washington, D.C. With an abundance of school and youth groups visiting, cultural offerings and as the political centre of the country, Washington D.C. is the ideal city to introduce MEININGER to the North American market. We are also proud to have Altus Realty, an experienced partner, by our side for this project,” declared Hannes Spanring, CEO of MEININGER Hotels. MEININGER currently operates 24 hybrid hotels in Europe. All in all, the total number of projects currently under development has grown to 13. MEININGER is expanding and continues to explore opportunities not only in Europe and North America but also in South Asia. MEININGER is a subsidiary of Holidaybreak Ltd, a travel group specializing in educational and activity holidays. Holidaybreak Ltd is a subsidiary of Prometheon Holdings (UK) Ltd, which is a part of Cox & Kings Ltd. Cox & Kings Ltd is listed on the National Stock Exchange, the BSE Ltd in Mumbai. MEININGER is a unique hotel product that combines the service and comfort of an international budget hotel with extra facilities, such as a guest kitchen and a games zone. The central location, high quality furnishings and fair prices appeal to people of all ages and backgrounds. With the right dose of MEININGER humor and an enthusiastic team, MEININGER hotels, with their guests from all over the world, become a real home away from home. The bedrooms range from traditional double rooms through private rooms with multiple beds right down to a bed in a dorm room. The hotels are tailored and adapted to the specific location and the market served by the hotel. The unique and flexible design of each hotel makes it possible to appeal to various target groups alike, such as school groups, families, individual travelers and corporate guests. MEININGER currently operates 24 hybrid hotels in Europe, with a total of 12,662 beds in 14 European cities including Amsterdam, Berlin, Brussels, Copenhagen, Frankfurt/Main, Hamburg, Leipzig, London, Milan, Munich, Salzburg, Saint Petersburg, Rome and Vienna. Contracts for 13 new hotels in Bordeaux, Brussels, Budapest, Dresden, Geneva, Glasgow, Heidelberg, Lyon, Munich, Paris, Zurich, Innsbruck and Washington DC have already been signed. MEININGER has ambitious plans for growth – in this regard, the focus is no longer only on Europe – possibilities for an expansion to Asia is also being sounded out. In the ‘TREUGAST Investment Ranking 2016’, the MEININGER Group achieved an AA rating. In the Dun & Bradstreet Risk Assessment MEININGER (Hotels Limited) is rated 5A 1 (based on end of FY 18). The MEININGER group is headquartered in Berlin. Altus is a full-service real estate development and investment company based in Washington, DC. From repositioning underperforming assets to developing ground-up projects, Altus focuses on creating mixes of residential, office, retail and hospitality experiences that inspire. With a thoughtful, crafted approach to each project, Altus seeks to build long-term relationships and value with its partners and tenants alike. Additional information about Altus can be found at altusre.com.